Presentation and Differential Diagnosis of Intramuscular Myxoma. Dept of Orthopadics, Sapthagiri Institute of Medical Sciences and Research Centre, Chikkasandra, Bangalore 560090. India. Introduction: Intramuscular myxoma is a rare benign soft tissue tumor involving the musculoskeletal system. The incidence is reported as varying from 0.1 to 0.13 per 100,000 population. Most patients present between the fifth and sixth decade of life. The swelling commonly occurs in the large muscles of the thigh, shoulder, buttocks and arms. The tumor can be diagnosed with certainty only with histopathological examination. Local recurrence is rare after excision. Case Report: A 73 year old male patient presented to us with a swelling of the anterior aspect of the middle third of the right thigh measuring about 8 x 4 centimeters. He was thoroughly investigated and the swelling excised in toto. The soft cystic swelling excised was found on histopathology to be an intramuscular myxoma. Conclusion: This case report is being presented since the tumor is rare and also an important consideration in the differential diagnosis of sarcomas, intramuscular lipoma, hemangioma, hematoma, and desmoid tumor. Another important feature is that it can be diagnosed with certainty only after excision. 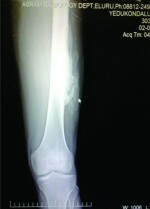 Keywords: Intramuscular myxoma, soft tissue swelling, benign. Myxomas are rare benign tumors. They occur at various locations such as heart, bones, skin subcutaneous and aponeurotic tissues, urogenital tract and skeletal muscles. They are known to originate from primitive mesenchymal cells, which lose their capacity to produce collagen, but produce excess hyaluronic acid and immature collagen fibers . The intramuscular myxomas involve larger muscle groups, can be seen in elderly, and can reach relatively big sizes, as seen in many soft tissue sarcomas, making it very difficult to distinguish it from them. Despite having a seemingly encapsulated look and well defined borders, the lesion microscopically infiltrates the muscle . A 73 year old male patient presented to us with a swelling of the right thigh. The swelling was painless and had gradually increased in size since its appearance 8 months prior to presentation to us. The swelling measured about 8 x 4 centimeters, firm in consistency and was mobile in the vertical plane. Its size reduced on active muscle contraction (Fig. 1). The patient was investigated with MRI, PET CT scan which revealed a solitary well encapsulated intramuscular mass without any distant lesions. FNAC revealed features of a benign cystic lesion – myxolipoma. Ultrasound examination was suggestive of a fibromyoma. Routine blood and urine examination had not revealed any abnormality. All of these investigations were performed before the patient sought treatment at our institution. (Fig 2, 3, 4) An excision of the tumor in toto under spinal anesthesia was done, taking care to avoid damaging the vessels lying in close proximity to it. It was a well encapsulated cystic mass (Fig 5). Patient had no post- operative complications and was discharged after a couple of days. The histopathological examination revealed on gross examination: A single globular well circumscribed soft mass measuring 6x5x4 centimeters, cut sections showing grey – white glistening gelatinous areas. (Fig 6) Microscopy showed abundant mucoid material with relative hypo cellularity, consistent with a myxoma. No significant mitotic activity was noted and it was encapsulated in bundles of striated muscles. (Fig 7, 8) The patient is under observation for more than two and half years now and has not shown any signs of a recurrence or the presence of similar swellings at different locations. In 1871, Virehow used the term myxoma to describe a tumor that histologically resembled the mucinous substance of the umbilical cord . Intramuscular myxoma is a rare benign tumor of the musculoskeletal system with an incidence ranging from 0.1 to 0.13 per 100,000 . It is common in the 5th and 6th decade of life. There is a slight female predominance . The tumor may occur in isolation or in association with fibrous dysplasia or Albright syndrome . When multiple, and are associated with fibrous dysplasia, they are called Mazabraud’s syndrome . Most intramuscular myxoma are solitary, painless, palpable mass that is firm in consistency and slightly movable and often fluctuant .It can occur in any location, but tends to involve the muscles of the thighs, buttocks, and shoulders. The current modes of imaging are Ultrasound, CT and MRI. On Ultrasound, the intramuscular myxoma appears as a hypo echoic lesion with a well-defined margin. Anechoic cystic foci may be present. On CT, Intramuscular myxoma usually presents as a well demarcated homogeneous low density lesion within the skeletal muscle. On MRI, the lesion usually appears as low signal intensity on T 1 weighted images and high signal intensity on T2 weighted, gradient echo or STIR images . It is difficult to diagnose this tumor before biopsy and microscopic examination . Due to abundant myxomatous tissue and poor cellularity, it is difficult to make a diagnosis on FNAC . Macroscopically the tumor is oval or spherical in shape and when cut open, it has a white or grey-white mucoid gelatinous surface. Small cyst like spaces or traversing trabeculae may also be seen. 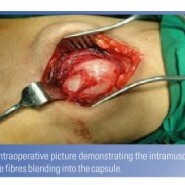 Although it appears well encapsulated, the delicate fibrous capsule is usually incomplete and most lesions show infiltration of adjacent musculature . On microscopic examination, there is abundant mucoid material and relative hypo cellularity and loose reticulin fibers. Vascular structures are sparse. The cells have a stellate shape with small hyper chromatic pyknotic nuclei and scanty cytoplasm. Some myxomas may show focal areas of hyper cellularity. However absence of nuclear atypia, mitotic figures or necrosis helps to rule out malignancy. Mucoid material stain positively for alcian blue, mucicarmine and colloidal iron. Immunohistochemical studies have shown staining for Vimentin and no reaction for S 100 . The tumor is to be differentiated from Sarcomas, metastasis, and other benign intramuscular tumors such as lipoma, hemangioma, hematoma, desmoid tumor . Surgical excision is curative. Recurrence is very rare [3, 4, 5]. To orthopaedic surgeons another point of interest is coexistence of intramuscular myxoma with fibrous dysplasia (Mazabraud’s Syndrome) [9-11]. This existence of an intramuscular myxoma may be an indication for skeletal survey to detect previosly silent fibrous dysplasia lesion which can be then followed up regularly. Intramuscular myxoma is thus a relatively rare benign lesion affecting the musculoskeletal system. 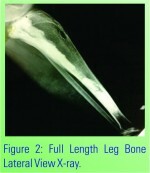 Surgical in toto excision is imperative and curative. An elderly patient presenting with a solitary soft tissue tumor should therefore be thoroughly investigated to rule out the soft tissue sarcomatous conditions, which in many ways mimic the intramuscular myxoma. The above case report amply highlights these facts. 1. Tan HM , Peh WC , Shek TW . A distinctive shoulder mass. Br J Radiol 2001;74:1159–1160. 2. Kabukcuoglu F, Kabukcuoglu Y. Mazabraud’s syndrome: Intramuscular myxoma associated with fibrous dysplasia. Orphanet Encyclopedia. Jan 2005. 3. 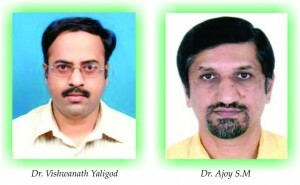 Aind R A, Dwivedi M K, Pal R, Devangan L, Shekhar P V. Intra-muscular myxoma of gluteal region. Indian J Radiol Imaging 2004;14:177-8. 4. Ozbek N, Danaci M, Okumus B, Gursel B, Cakir S, Dabak N, Karagoz F. Recurrent intramuscular myxoma: review of the literature, diagnosis and treatment options. Turk J Cancer. 2006;36(2):75. 5. Robert J Logel. Recurrent Intramuscular myxoma associated with Albright’s Syndrome: Journal of Bone and Joint Surgery: Vol 58-A, NO. 4:565-568. 6. PN Chan, SF Lee, TC Chow, YL Chan. A rare benign tumour – Intramuscular Myxoma. J HK Coll Radiol 2004;7:40-3. 7. Choukimath M Sharanabasav and Rangappa P K. Fine needle aspiration cytology of soft tissue tumors with special emphasis on grading of spindle cell sarcomas. International Journal of Applied Biology and Pharmaceutical technology. 2012:3(2):247-260. 8. Valer A, Carrera L, Ramirez G. Myxoma causing paralysis of the posterior interosseous nerve. Acta Orthop Belg. 1993;59(4):423-5. 9. Mazabraud A, Semat P, Roze R. Apropos of the association of fibromyxomas of the soft tissues with fibrous dysplasia of the bones. Presse Med. 1967;75(44):2223–2228. 10. Dreizin D, Glen C, Jose J. Mazabraud syndrome. Am J Orthop (Belle Mead NJ). 2012 Jul;41(7):332-5. 11. Zoccali C, Teori G, Prencipe U, Erba F. Mazabraud’s syndrome: a new case and review of the literature. Int Orthop. 2009 Jun;33(3):605-10.